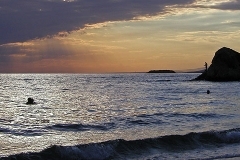 It is one of the most beautiful beaches in Halkidiki. The water has a characteristic green-blue color. It is relatively shallow and has a cool temperature most of the time during summer. The bay that surrounds the beach usually keeps the sea calm. The sand is thin and it is suitable for long periods of sunbathing. The rocky coastline around the beach is ideal for exploring the seabed and for recreational spear fishing. Access to the brach is via a steep path through the rocks. If you have mobility problems or very young children, consider the way through “Makendos” Hotel 500m away. The sea is excellent and warm late in the afternoon. 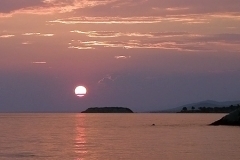 Then you may admire the famous sunset of Sithonia. The bay keeps the water in a good temperature for swimming even early in May or June. Access to the beach is free. On the south part, there is a beach bar and the beach facilities of Hotel “Makednos”. Keep the beach and the sea clean by picking up your garbage. Do not wait to be picked up by someone else as this most probably won’t happen. Difficult. For more accessible beaches, please choose from the blue flags beaches.